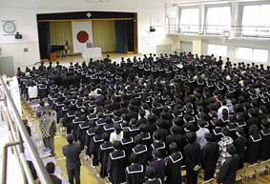 Students fill a gym at a graduation ceremony for a junior high school. Photo Courtesy of Yamaguchi Junior High School. As students have formal entrance ceremonies when they enter school, they also have formal ceremonies as they leave. The graduation ceremony, held in late March, is a very solemn event, without the frivolity found in many US ceremonies. The principal presents the students their diplomas, followed by a number of speeches from the principal, other teachers and younger students, which all speak of their memories of the graduating students. The graduates then also present messages to their teachers, parents and other students.